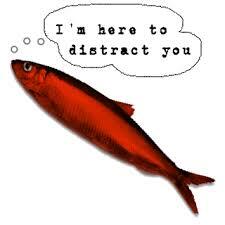 A red herring is a diversionary tactic. In a mystery, a red herring can be a character, an object, a significant time, day, week, year, weather, or place. It appears to be a clue, but it’s a logical implication that leads readers on a false trail. The key is logical. Writers don’t use them only to mislead the reader. The red herring has to have importance in the story but not for the reason the reader suspects. In my multidimensional novel, Norman in the Painting, I use a tray in an antique store as an object that the protagonist and reader think is the object that draws Norman out of the painting. A few chapters later, a minor character proves the tray is not significant in Norman’s appearances. It was a logical object because it has a Norman Rockwell scene on it and Norman is a typical Rockwell figure. As I progress to the eleventh chapter, and being a pantser, I have to plan for at least one, maybe two red herring characters. I don’t like to plot, but in a mystery, I have to do some pre-planning. I’ve set up some possibilities. Arctarius, Jack, or a criminal that committed a recent murder are feasible. Each of those characters has importance in the plot. I didn’t put any of them in the story merely to mislead the reader. However, my problem now is to find their possible reasons for committing the past and the future murders. At this point, the protagonist suspects Arctarius or the criminal. To her, Jack is annoying, so he’d be the least one to suspect. He’d be a good red herring. Trouble is, I don’t have a clue what motive to assign to him. Since he wants to be more than a minor character, maybe he’ll come up with one and then I’ll be surprised too.